The Seven Skills of Conscious Discipline are the only skills needed to transform everyday discipline issues into teaching moments. These skills provide adults with the knowledge base to teach children the skills necessary for self-regulation, conflict resolution and pro-social behaviors. 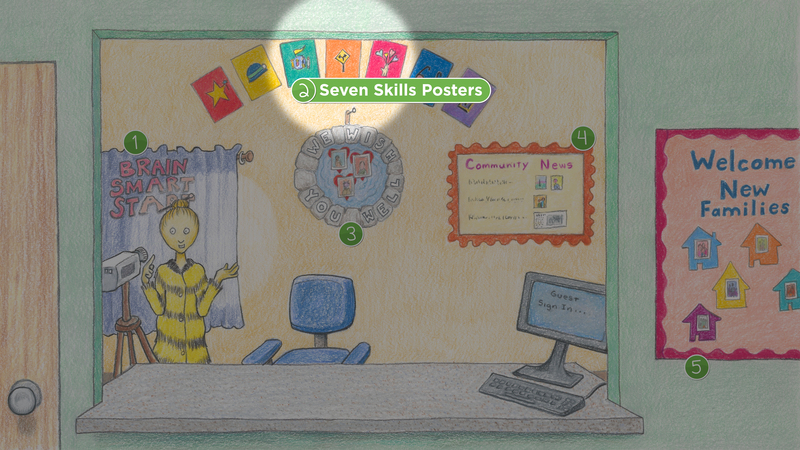 Post the Seven Skills Poster Set in the reception area as a helpful reminder of the language and concepts of Conscious Discipline for everyone entering the school. You may hang all the posters all at once, or swap the posters monthly to match the skills you are studying in your school-wide staff development and book study groups. The Seven Skills of Conscious Discipline are Composure, Encouragement, Assertiveness, Choices, Empathy, Positive Intent and Consequences. The front of each Seven Skills Poster provides a bright visual reminder for each of these skills and the specific language that supports them. The back of each poster provides helpful information for creating the Conscious Discipline classroom structure that corresponds to each skill.